The statue of a crucified Russian President Vladimir Putin has appeared at an art exhibition in the center of Latvia's capital, Riga, local media report. Visitors are allowed to put nails into the installation, but not everyone is keen to do so. The statue is part of a 10-exhibit art display which can be visited free of charge. 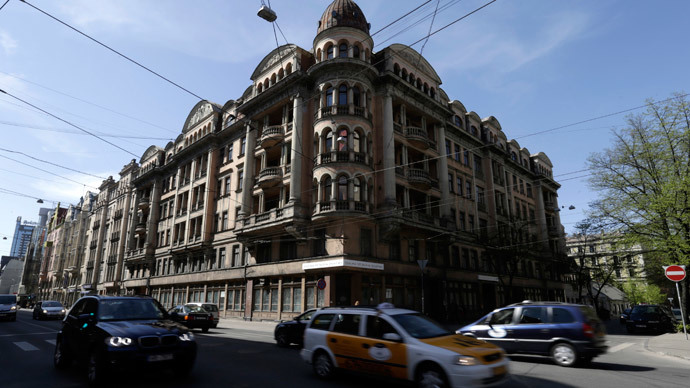 It is located near the building which in Soviet times housed the Latvian headquarters of the KGB security service. It depicts Putin on a red cross, with nails driven through his hands and head, complete with a crown of barbed wire. Unlike the creators of the other exhibits, the author of this piece has preferred to remain anonymous, reports Latvian channel TV5. The statue is interactive: visitors are welcome to drive more nails through Putin's effigy. However, TV5 reports the viewers are split, some putting nails into the exhibit and others pulling them out. "It is logical that this exhibit is in the center of Riga," TV5 quotes one visitor. "He [Putin] used to work in the security service himself and deserves to have a nail driven through him," the viewer, whose name is only given as Ronalds, said, referring to Putin's work in the KGB in 1975-1991. Insulting government and officials can be regarded a crime in many countries. In Russia, it is punishable by a fine of up to $800, up to 15 days of community service, or up to a year of correctional labor. The exhibit in Riga is a yearly event dedicated to the history of the 20th century. This year it consists of 10 objects, including, besides the crucified Putin statue, an overturned and bleeding car, which also serves as a fountain. According to the artist, it symbolizes people's indifference to each other.